The Cities and Knights of Catan (German: Städte und Ritter) is an expansion to the board game Settlers of Catan for three to four players (five to six player play is also possible with the Settlers and Cities and Knights five to six player expansions). 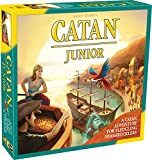 It contains features taken from the Settlers of Catan, with emphasis on city development and the use of knights, which are used as a method of attacking other players as well as helping opponents defend Catan against a common foe. Cities and Knights can also be combined with the Seafarers of Catan expansion (again, five to six player play only possible with the Seafarers five to six player expansion), although players are not recommended to use the Cities and Knights rules in Seafarers scenarios where exploration is a gameplay element. Because of the new gameplay elements introduced in Cities and Knights, the game is typically played to a greater number of victory points. One of the main additions to the game are commodities, which effectively act as secondary resources produced only by cities (and not settlements). Like resources, commodities are associated with a type of terrain, can be stolen by the robber (with Seafarers, also the pirate), can count against the resource hand limit, and may not be collected if the robber is on the terrain. Resources may be traded for commodities, and commodities may be traded for resources. Commodities can then be used to build city improvements (provided the player has a city), which provide additional benefits. The commodities are paper (which comes from forest terrain), coin (which comes from mountain terrain), and cloth (which comes from pasture terrain). When combining Cities and Knights with Seafarers, the rules are ambiguous with regards to whether commodities are collected along with normal resources when collecting from a Gold River tile, as well as whether or not commodities can be collected directly from Gold River tiles. A city on wheat or clay gives 2 of each, as if in the original settlers. While sheep, ore and wood yield cloth, coin, and paper, respectively, wheat and clay act as fuel in speical functions: wheat activates knights, and clay allows for a city wall. If a player has a city, they may use commodities to build city improvements, which allow the user several advantages. City improvements come in a total of five levels, and in three different categories, with each category of improvements requiring a different commodity and higher levels requiring more cards in that commodity. At the third level, players earn a special ability. The first player with an improvement at the fourth level can claim any of their cities as a metropolis, worth an additional two points. Each type of improvement has only one associated metropolis, and no city can be a metropolis of two different types (because of this, a player with only metropolises and settlements may not build improvements beyond the third level). If a player is the first to build an improvement to the final level, they may take the metropolis from its current holder. The other significant concept in Cities and Knights are the concept of knights, which replace the concept of soldiers and the largest army. Knights are units that require continuous maintenance through its activation mechanism, but have a wide variety of functions. Knights can be promoted through a total of three ranks, although promotion to the final rank is a special ability granted by a city improvement. If a knight is promoted or forced to retreat, its active status does not change. Cities and Knights introduce a third die, known as the event die, which serves two functions, the first of which applies to the concept of barbarians, a periodic foe that all players must work together to defend against. The barbarians are represented by a ship, which is positioned on a track in special "double-hex", representing the distance between the ship and Catan (ie. the board). Each time the event die shows a black ship, the barbarian ship takes one step closer to Catan. When the barbarians arrive at Catan, a special phase is immediately performed before all other actions (including collecting resources). In this special phase, the barbarians' attack strength, corresponding to the combined number of cities and metropolises held by all players, is compared to Catan's defense strength, corresponding to the combined levels of all activated knights in play. Should the barbarian attack be successful (that is, the attack strength be greater than the defense strength), the player who contributed the least amount of defensive points is forced to reduce a city (not a metropolis) down to a settlement. If there is a tie among this distinction, then all tied players must (if possible) reduce a city to a settlement. If the lowest contibutor(s) only have metropolises, then the next-lowest contributor(s) must reduce a city to a settlement. It may be the case where players tie for the lowest contribution, with some of the players lacking cities to reduce (in which case the players without cities is exempt), or the case where all players are reduced to settlements and metropolises, in which case nothing happens. There may also be the case where reducing a city would leave a player with six settlements (a player is only given five settlements), in which case the city token is turned on its side until another city is built. Should Catan prevail, the player who contribute the most to Catan's defense receives a special Defender of Catan card, worth an extra victory point. Regardless of the outcome, all knights are immediately deactivated, and the barbarian ship returns to its starting point on the track. 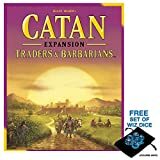 As the likelihood of having the barbarian move closer to Catan is very likely, under Cities and Knights the robber (and with Seafarers, the pirate) does not move until the first barbarian attack, nor can a knight move the robber before that point. The other significant function of the event die concerns itself with Progress cards, which replace development cards. Because of the mechanics of progress cards explained below, one of the two white dice used in Settlers is replaced by a red die. Progress cards are organized into three categories, corresponding to the three types of improvements. When a castle appears on the event die, progress cards of the corresponding type may be drawn depending on the value of the red die. Higher levels of improvements will allow for a greater likelihood that progress cards will be drawn, with the highest level of improvement allowing progress cards to be drawn regardless of the value on the red die. Progress cards, unlike the development cards they replace, can be played on the turn that they are drawn, and more than one progress card can be played per turn. With the exception of two types of progress cards, however, they can only be played after the dice are rolled. Progress cards granting victory points are played immediately (without regards to whose turn it is), while the Alchemist progress card, which allows a player to predetermine the roll of the white and red dice, necessitates the card being played before rolling the dice. Players are allowed to keep a total of four progress cards (five in a five to six player game), and any additional ones must be discarded on the spot or (if it is the player's turn) played. In the event of a failed barbarian attack and there is a tie among the greatest contributors, none of the tied players earn a Defender of Catan card, with each of the tied players drawing a progress card of the type of their choosing instead. Similarly, if there are no Defender of Catan cards remaining, a progress card is drawn instead. City walls are a minor addition to Cities and Knights that increase the number of resource and commodity cards a player is allowed in their hand before having to discard on a roll of 7. However, they do not protect the player from the robber, he still may not produce resources or commodities from a hex on which the robber has been placed. Only cities and metropolises may have walls, and each city or metropolis can only have one wall, up to a total of three walls per player. If the barbarians pillage your city (i.e., reduce it to a settlement), then the city wall is also destroyed. You must remove the city wall from the board. The merchant is another addition to Cities and Knights. Like the robber, the merchant is placed on a single land hex. Unlike the robber, the merchant has a beneficial effect. The merchant can only be deployed through the use of a Merchant progress card (of which there are six), on a land hex near a city or a settlement. The player with the control of the merchant can trade the resource (not commodity) of that type at a two-to-one rate, as if the player had a control of a corresponding two-to-one harbor. The player with the control of the merchant also earns a victory point. Both the victory point and the trade privilege are lost if another player takes control of the merchant. The rules are ambiguous whether the merchant and the robber can be placed on the same hex, and if so, whether having the robber on the same hex as the merchant disables the trading privilege or the victory point. When played with Seafarers, the rules are also ambiguous whether the merchant can be played on a Gold River hex, and if so, whether two resources of different types may be traded. Spy - View a person's cards and steal one. Arsonist - Player with equal or greater victory points as you loses half their resources/commodities. Medicine - build a city for 2 ore and 1 wheat. Crane - Progress for 1 commodity less. Check here more information about the Cities and Knights Game Rules.